Students from three provinces will descend on the University of New Brunswick’s Fredericton campus this week as they vie for more than $19,000 in cash and prizes in a business plan competition. BMO Financial Group, in partnership with the University of New Brunswick’s International Business and Entrepreneurship Centre (IBEC), will be hosting the BMO Financial Group Apex Business Plan Competition at the Wu Conference Centre from today, Jan. 24, to Friday, Jan. 26. “This competition brings together entrepreneurial-minded students to celebrate talent, encourage entrepreneurship as a viable option for the future, and prepare them for the challenges of a volatile global marketplace,” says Karen Murdock, director of the International Business and Entrepreneurship Centre. The competition gives undergraduate and graduate students harbouring an entrepreneurial spirit the opportunity to pitch their budding ideas to the business world and network with other entrepreneurs. Eighteen teams from New Brunswick, Nova Scotia and Ontario will compete in either the undergraduate or graduate track and will develop, direct, organize and present their business plans in a practice round, gaining advice from a panel of New Brunswick business leaders before going head-to-head. The judging panel will move on to choose the best three teams in each of the undergraduate and graduate levels. Those six teams will advance to the finals on Friday. The public is invited to take in the finals between 12:30 p.m. and 4:30 p.m. Friday in the J. Harper Kent Auditorium as teams work to convince the judges that they have the most promising and plausible business plan. Five thousand dollars will be awarded to the winning team at each of the two levels, with additional cash prizes going to first and second runners-up as well as the winner of the Viewers’ Choice Award, voted for by teams, judges and the audience. Awards will be handed out at a gala dinner Friday at 7:30 p.m., when Country Liberty co-founder will give a keynote address. Mr. Hannay, who placed second in the 2016 Apex competition, will speak on his journey from professional hockey player to CEO of a country-lifestyle clothing brand. 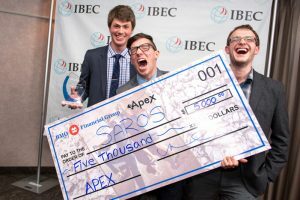 Photo: Team Saros celebrates after winning $5,000 at the 2016 BMO Financial Group Apex Business Plan Competition. From left, Jonathan Waye, Alex Battah and Kris Bowman. Credit: Joy Cummings / Photo UNB.